Now THAT'S a Bright Green Boat! I saw this boat last time I was out for Vogalonga. It was one of two moored with nobody on board. 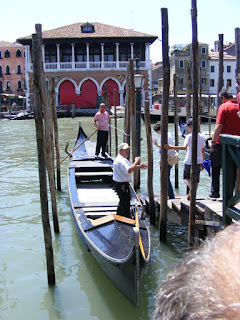 A post here on the Gondola Blog entitled "Indescribably Green" has photos and comments about the boats. Tamás caught this shot and sent it to me. Looks like they had an all-female crew. 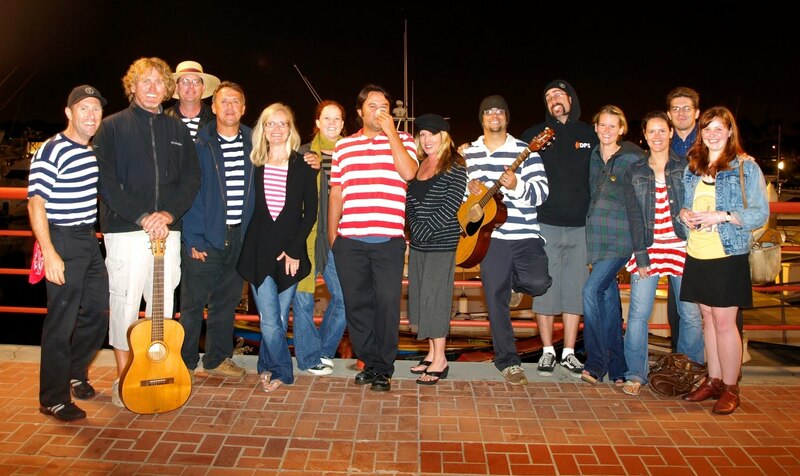 As of this writing, the photo at the top of the blog is this image, taken on August 16th, 2010 in Newport Beach, California. 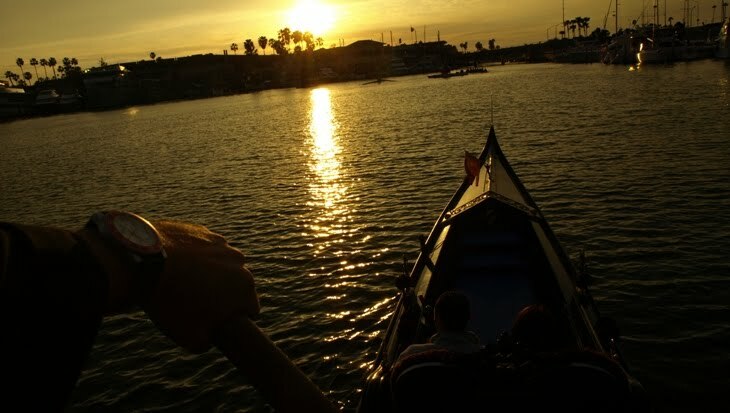 I was rowing with passengers on the Phoenix and snapped the shot - with camera in one had, remo in the other. 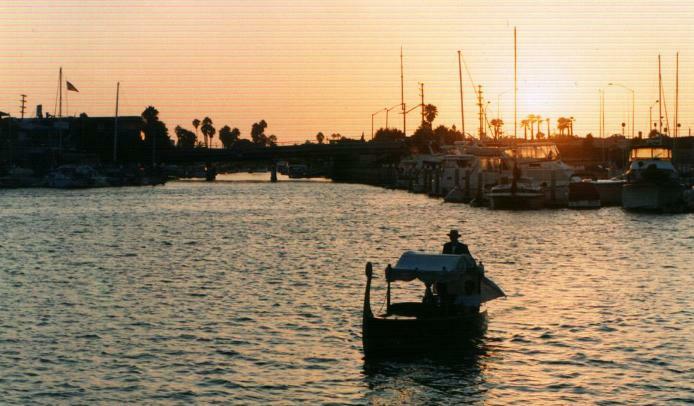 This photo was taken some time in 1996 in Newport Beach. The gondola is the Elisa Marie. 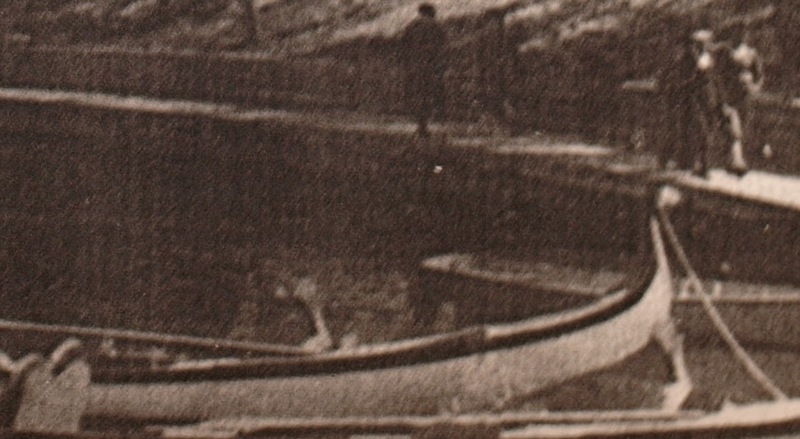 This is one of the first photos ever taken of the boat after her launch that year. Taken September 15th at one of Sunset Gondola's get-togethers. It has become a tradition to post the "group photo" here shortly after the get-togethers at Sunset Gondola. while the photo was shot two and a half years ago, the image is timeless. The gondolier is Chris "Rotto Sorriso"
This photo and others from the shoot were posted in "Early Evening Departure at Sunset Gondola"
This is one of my favorite blog headers yet, it was taken August 1st from the upper deck of one of Newport's charter yachts. The full shot can be seen in the post "Silhouette". This one was shot on February 21st, 2010 - it was my birthday, so naturally I was having a great time that day. The photographer was Shelly Ferraro - one of my passengers. This series of photos was taken from the shore of Brush Creek in Kansas City, Missouri. The gondolier is owner/operator Chris Sperry who runs two gondolas there. Chris finished out his two boats with great attention to detail. A lot of custom-crafted wood went into each vessel. I visited Chris at his operation in September of 2009 when I was there for the Kansas City Expedition down the Missouri River. It was so great to see a guy take such pride in his operation, and he's not on a bad piece of water either. Bacino Orseolo at Night - Hard Rock Cafe, Really?! Having been to Bacino Orseolo many times, I expected things to remain the same, and for the most part they did. For the most part. Entering from Piazza San Marco, I turned left at the bookstore, and there it was - the biggest sign of commercial takeover since McDonalds. 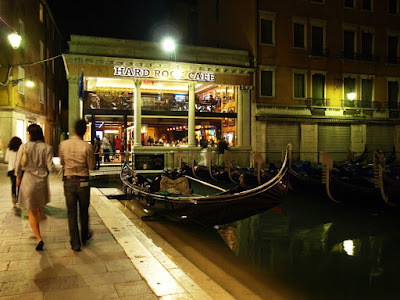 The Hard Rock Cafe of Venice. Granted, this is probably a lot more tasteful than what they had originally planned. There are no Cadillac cars sticking out of the roof or anything like that. But it just didn't sit right with me. I'm sure nobody reading this would disagree. In fact one of the hot tourist items I've seen sold in Venice is a calendar of gondoliers. 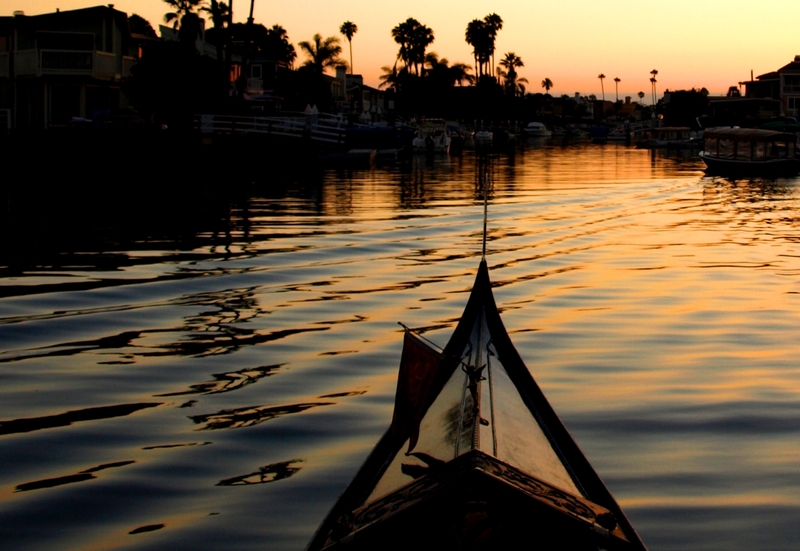 Rowing for a living keeps the body in shape. Guys who go for the job tend to be active in other ways; like surfing, cycling, and snow sports. 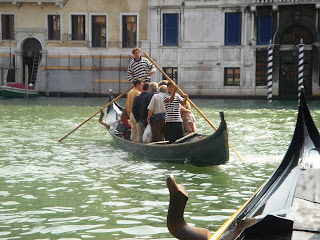 Gondoliers tend to be tan and generally look dang good in stripes. I guess it was just a matter of time before something like this happened. 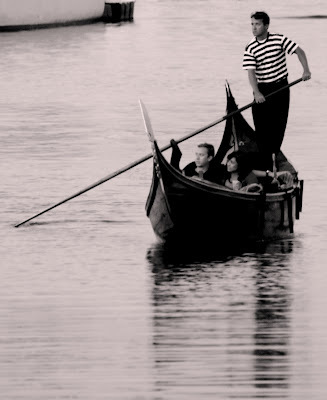 A gondolier on a show about models. I spoke with Tim when they were filming this episode, and was sworn to secrecy. - I can tell you that Tim Reinard of Sunset Gondola will be seen on America's Next Top Model (of course you probably already figured that out from the title of this post. - I can tell you he had Tyra Banks on his boat. - and I can tell you He had a blast doing the show. The rest you'll need to find out for yourself. Tune in to the CW network tonight at 8pm Pacific time, or check your local listing, and see what happened. To learn more about the show in general, click on this link. Here's a snooping snap I took while visiting Angelino and April's operation in Oakland, California back in early April. I had hoped to meet up with them, and called ahead, only to find out that while I was going to be in their neighborhood, they would be down south near mine. The rain was a spoiler that day. I arranged to meet one of the gondoliers, but Mother Nature sometimes knows how to ruin a good plan. I remembered where he kept a special sandolo. From what I could see, she was the same masterpiece I'd seen years earlier. I must clarify here, that it is NOT a good idea to nose around like I did, and, um, don't try this at home kids. 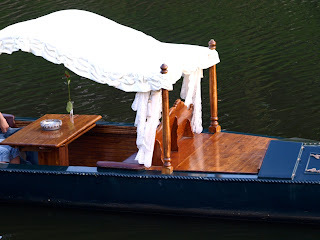 I should also apologize to the Gondola Servizio staff for my snooping, but the boat is beautiful and I just knew you all would appreciate seeing an image of her. 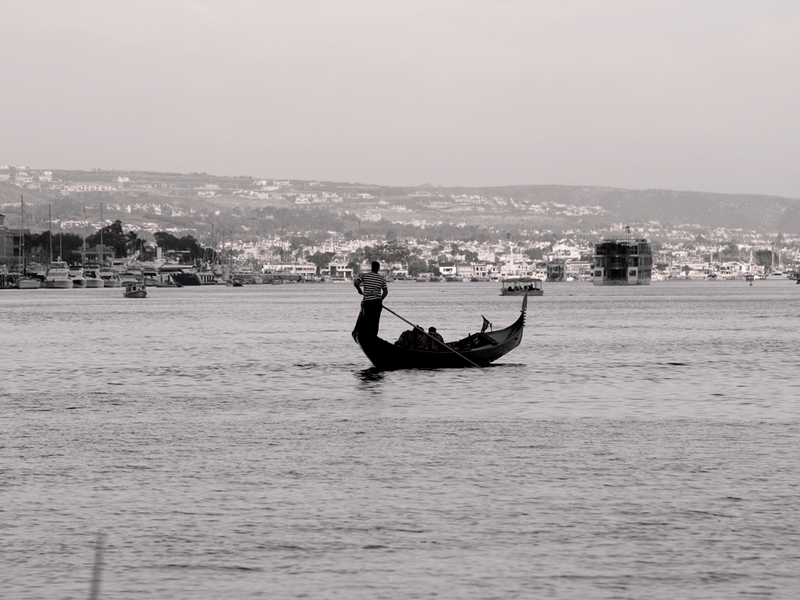 To read my post from that day, go to "A Rainy Day Around the Bay"
and for some photos of the gondolas on Lake Merritt taken that day, go to my post "Rainy Day in Oakland". Gondola Servizio's website is gondolaservizio.com. 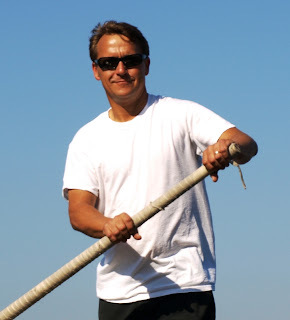 Just a quick post to wish gondolier Robert Dula a happy birthday. Roberto, (seen above in a photo I shamelessly stole from his Facebook page) has been known by many other names - "Hurricane Bob" is my favorite. Roberto has survived more natural disasters than any gondolier I know. He exemplifies dedication and tenacity. So take your hats off for Mr. Dula. Oh, and yes, that's Vanna White in the photo. I'm not sure how he got it, but I'm sure there's an interesting story. 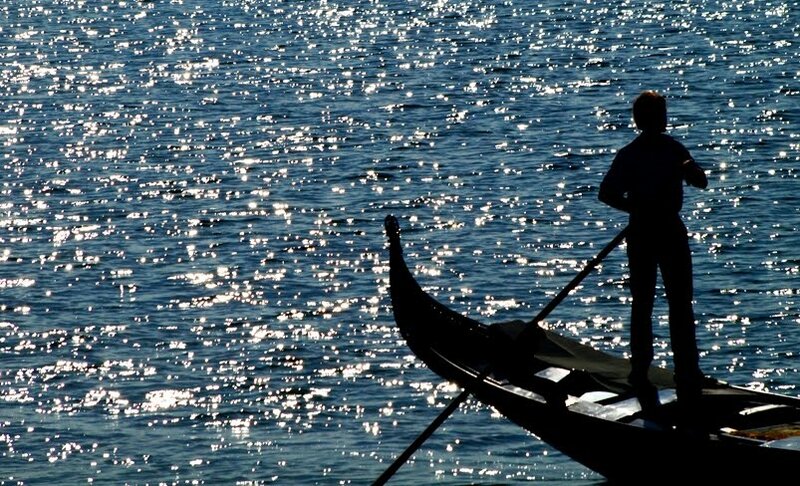 For centuries Venetians have passed down the art of voga-alla-Veneta to the next generation. Here's a pair of photos that really brings the point home. I love how the two girls are rowing the same remo together. 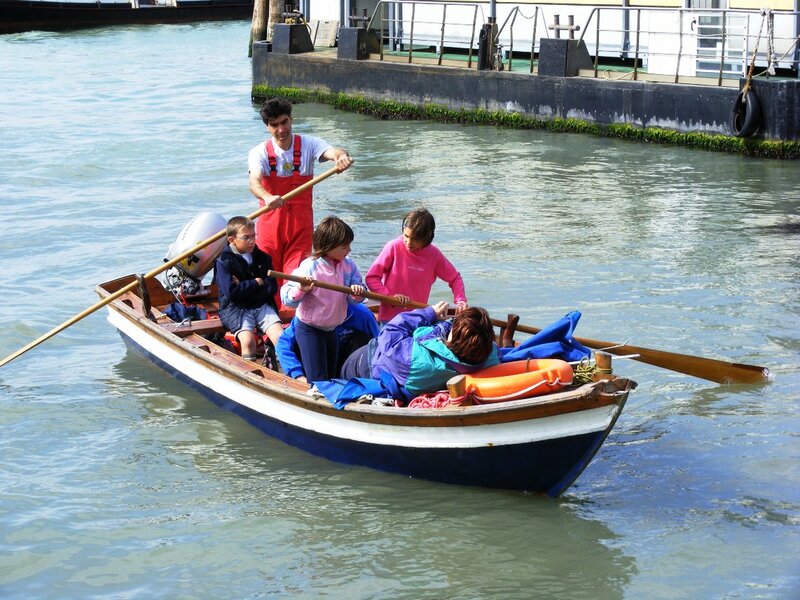 But what's even better is the young boy sitting with his arms crossed, looking annoyed that the girls get to row. Of course there are a few other family members on hand to take pictures. And yes, there's a big Honda outboard hanging off the back of that boat, but the guy's still got forcole and remi. 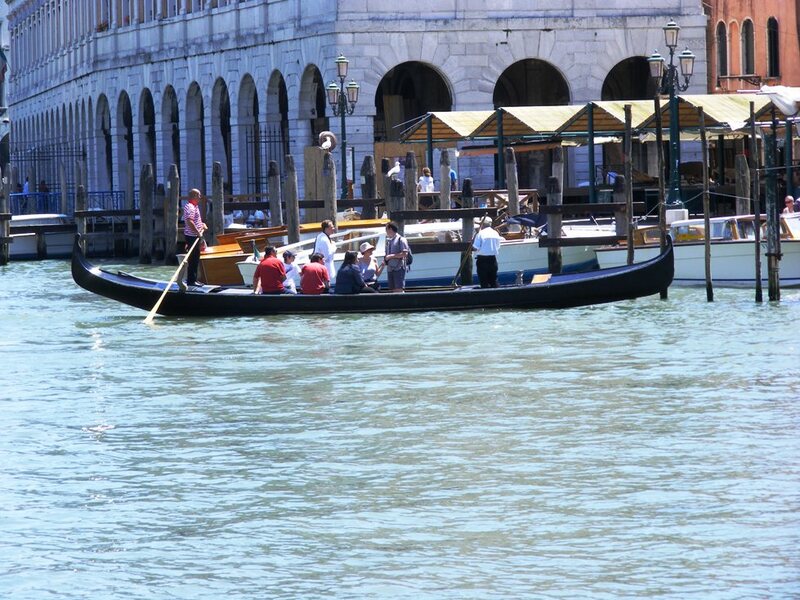 A true Venetian can row just about anything. While most of the gondolas at Bacino Orseolo are rafted together and tucked in for the night, often when I pass by there I see one gondola moored along the stairs like the one pictured above. A while back I inherited this image from a friend. In a world where everything seems to be going digital, a Xerox copy of an old black and white photo was easily forgotten in my file cabinet for the longest time. When I rediscovered the thing, I thought about scanning it, but decided instead to just lay it on the floor and shoot it with my camera. Nobody seems to know who the original photographer was, and chances are, he or she has long since gone to the big "traghetto in the sky". If I could find the person who shot this image, I sure would have some questions to ask. 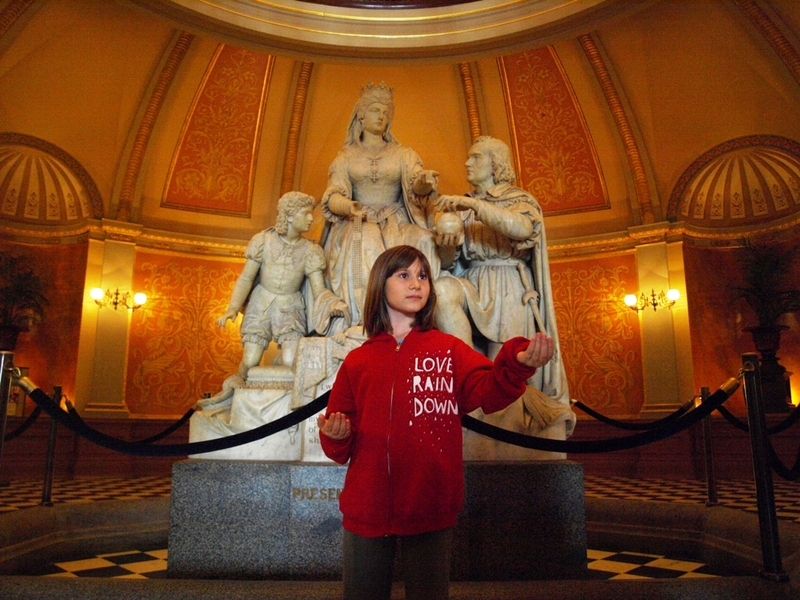 Before I posted the photo, I did a little research to learn more about the history here. The photo is indeed historically significant. 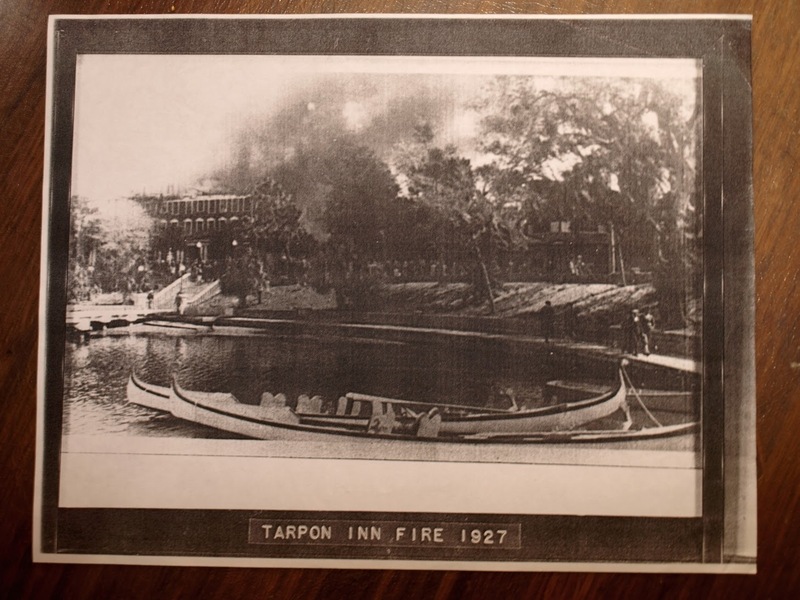 North America has seen more than one "Tarpon Inn", but only one of them burned down in 1927, and that's the one in an area north of Tampa, Florida known as Tarpon Springs. 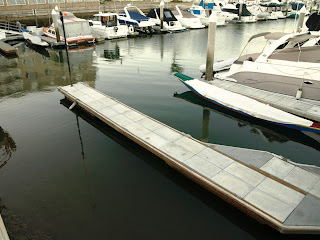 The region is best known for it's "sponge docks", which have not only had a role in the local economy, but also served as a centerpiece for the rich Greek community there and in surrounding communities. The image may be monochrome, and far from clear, but that "frame structure" in the background sure looks like it's on fire. Of course I didn't throw this image up here to talk about a hotel fire eighty-three years ago. In case you hadn't noticed, there are two gondolas in the foreground. 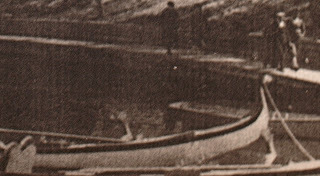 Looking at the details of the two boats in the picture, we can figure out the answers to many questions, but then new ones arise. Having looked at a lot of gondolas over the years, I would suspect we are looking at two Venice-built gondolas. There is always the chance they were really faithful recreations built somewhere else, but with fewer Americans knowing exactly what a gondola looked like back then, it seems unlikely. 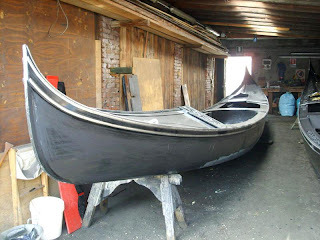 In my opinion most American builders wouldn't focus so much on exact recreation in the time these boats would have been built. How they ended up painted white remains a mystery to me. 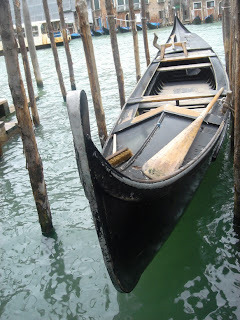 I have several theories about non-black gondolas outside Venice, but that's another subject for a future blog post. In this case, the fact that these boats were white probably helps us sort things out visually. My eyes are initially drawn to two things. 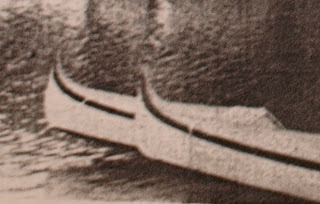 The complex curve of the rail, and the presence of what looks like two authentic forcole. Like the boats themselves, these forks could have been recreations (carved by Venetians living in Florida), but they sure look like the real thing. These two gondolas appear to each have the standard heart-shaped "main seat". Additionally we see several other seat backs. They could be the backs of chairs, or similar double seats like the aforementioned "main seat". 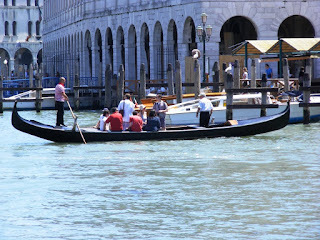 The structure of the gondola in front is fathful enough to Venetian design to have a portela. Upon closer inspection I also noticed the distinct silhouette of a brass seahorse, or "cavallo" as it is called in Venice. 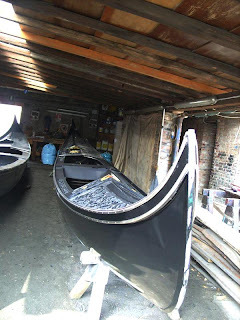 Finally, looking at the bows of these two gondolas, we see an obvious absence of ferros. The lack of ferri remains a mystery to me. 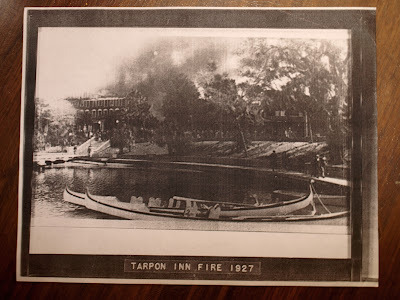 I've seen information and images from the era attesting to the presence of gondolas in the Spring Bayou, but the photo we see here is by far the most detailed piece of evidence I've encountered so far that gondolas occupied the waters near Florida's west coast north of Tampa. 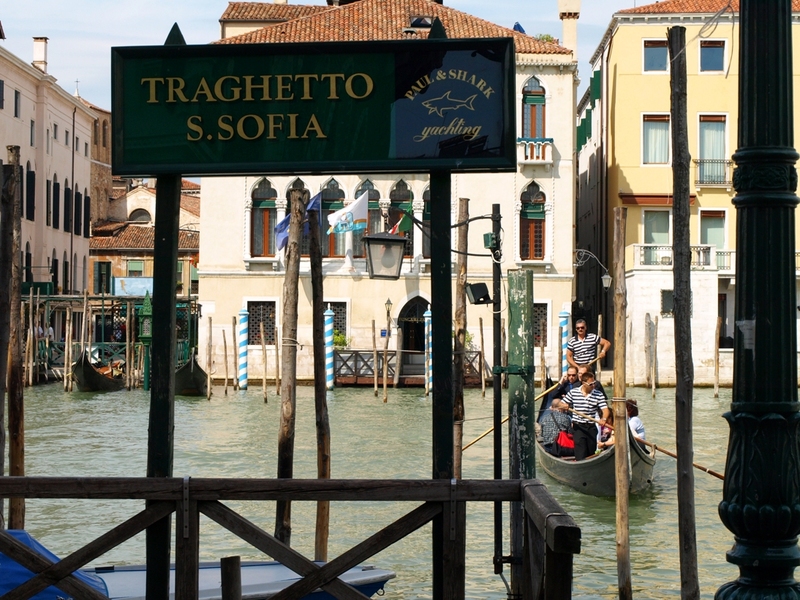 How Venetian gondolas ended up in an area so known for it's Greek population makes me wonder. Tarpon Springs actually has the highest percentage of Greek-Americans of any U.S. city today. I can't help but wonder though, about whether a few transplanted Venetians found the area appealing enough to call it home back in the 20's. After all, according to some sources, it's the "Venice of the South!" IndepententTraveler.com recently featured a slideshow article mentioning some of the places in the world known to be the "Venice" of their region. It's an interesting look at how places are interpreted and compared to La Serenissima. Check out The World's Most magical Canal Cities. 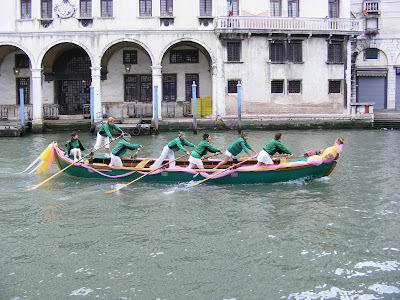 Tamás caught this image of a team of women from the Remiera Canottieri Cannaregio during Vogalonga. I don't think the pink and yellow tule comes standard on a caorlina from the club of green and black. As gondola operators we love it. We row on it, wouldn't be in business without it, and are quite accustomed to its various moods and methods. Sometimes it splashes into our boats. Sometimes it tries to sneak between the planking to find a resting place in the bilge. Then there are days when water simply falls from the sky – sometimes in sheets. Today was one of those days for us in Southern California. I awoke this morning to hear the rumble of thunder - something we don't hear often in this area. The tap-tap-tapping of rain gave way to a showering sound as I watched the world outside my window get a washdown. The distant thunder was soon replaced by the loud "CRACK" one hears when the storm is right overhead. Flashes of light were immediately followed by thunderous crashes as the rain dumped on my roof. c. would need to be checked on anyway - Murphy and his law are not to be second-guessed. spend some quality time with a shop-vac - hitting all the places my bilge pumps miss, taking note of any maintenance I might need to be tending to as a result of the rain, and swearing a little under my breath when nobody’s around, as invariably, the rain will find its way into my underwear. The work was there, waiting for me to do it. No less than advertised, and I went at it with the same vigor and frustration I always do – knowing that it’s part of the whole package. We revel in the sunset cruises, the surprise proposals, and all the other stuff that is “worthy of writing home about”, but you’ve got to pay your dues along the way as well. 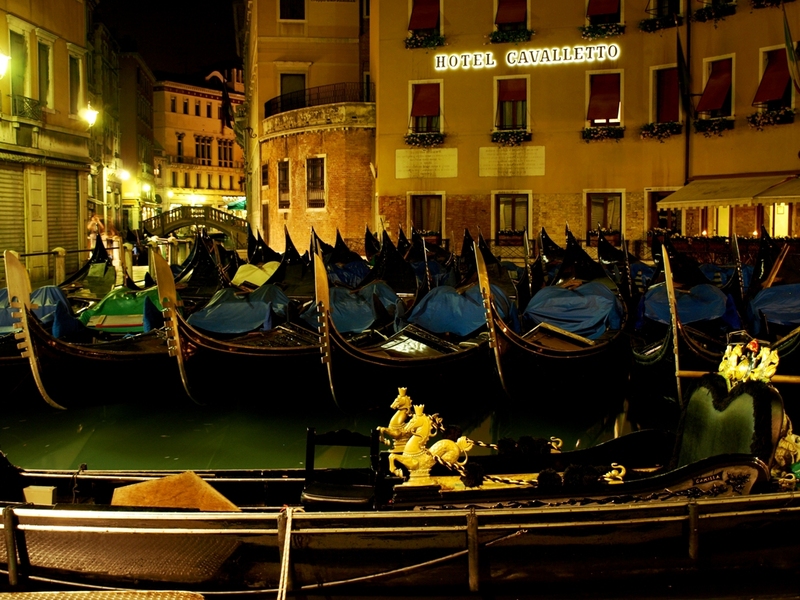 With a fleet of gondolas to care for, I wasn’t halfway through before my pants were soaked. The rain found its way into my socks too, which ended up bunched-up in the toes of my boots. In the end I managed to accomplish everything I’d set out to do and walked off the dock soggy but satisfied, knowing there were warm, dry clothes at home. And yes, the rain made it once again to my underwear – and I wore it like a badge of honor! Boarding the San Tomà traghetto, I noticed three passengers who'd already stepped aboard and seated themselves on the main trasto at the aft end of the passenger area. Most traghetto riders make the trip across standing up, but some grab the trasto, especially if they've been on foot a lot. 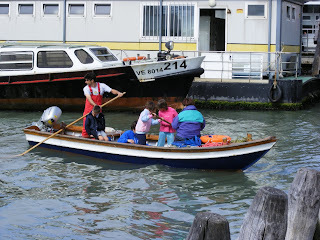 As we all waited for the boat to fill up, the poppa rower surveyed traffic on the Canalazzo while the ladies on the trasto caught up on the latest news of the day, and I just soaked it all up. 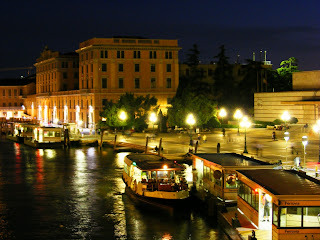 Here's a great evening shot taken by Tamás from the Ponte Scalzi of the vaporetto stop in front of Ferrovia Station. I can never get enough of such things. 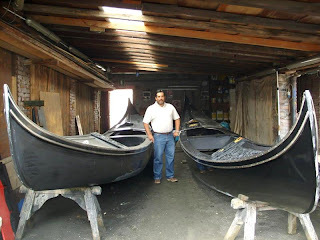 Emilia's blog is one of the few places I go each day to see what's newly posted, and today I discovered a nice post with some photos of the city's most photographed boat yard - Squero San Trovaso. Take a look, leave a comment, and then close your eyes and imagine working on a 36 foot boat in that storied yard. The deck of a boat can serve a multitude of purposes. 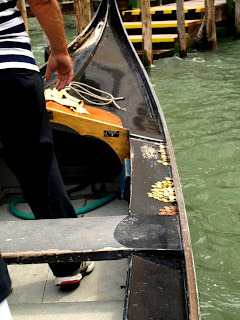 In my October 2nd post I mentioned that the forward gondolier on a traghetto tosses coins onto the deck, taking and making change on the spot. Here's a shot I took on board one of these canal-crossing ferries at the Servizio Gondola San Tomà. 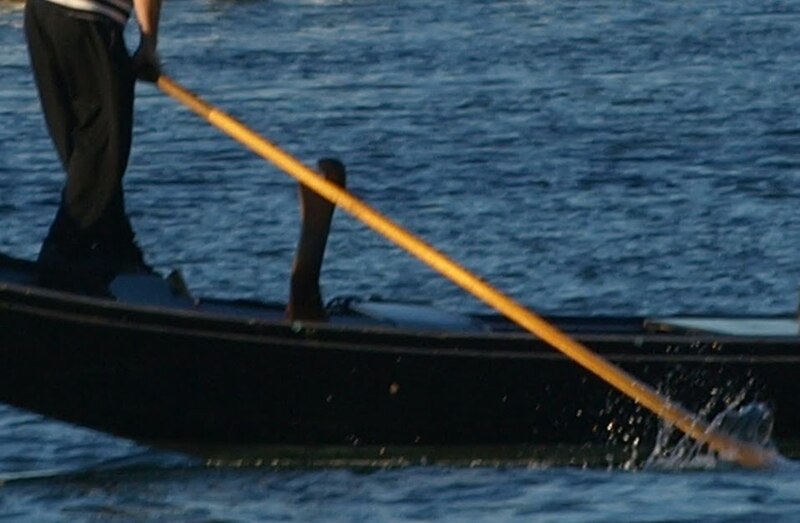 This gondolier's got a chamois for washdowns and a spare dockline sitting on the foredeck. And of course, he's got his coinage separated nicely along the rail. I see that he and I also have similar tastes in footwear. Venice becomes a whole different place. and you'll see rich colors and a warm glow that only comes out at night. but Bacino Orseolo is one of my favorites. I stopped by Sunset Gondola recently and found a few things missing. 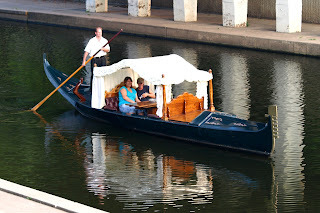 Namely, gondolas. 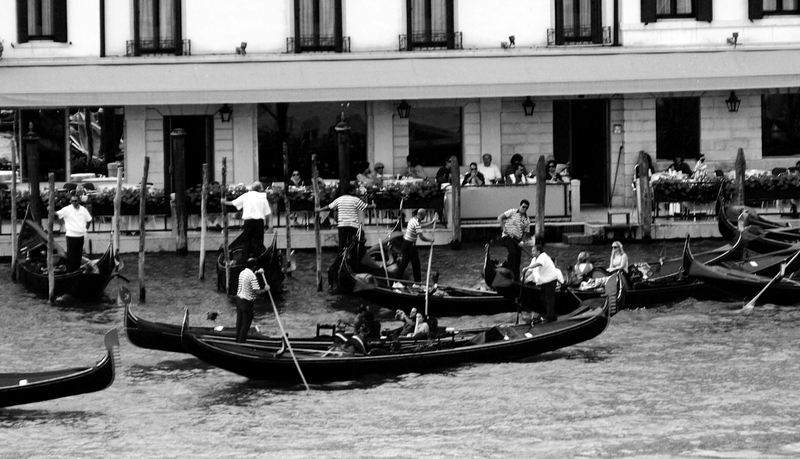 All three of the gondolas were gone - out on cruises. From a gondola operator's perspective, it was a beautiful thing. In this economy, even more so. 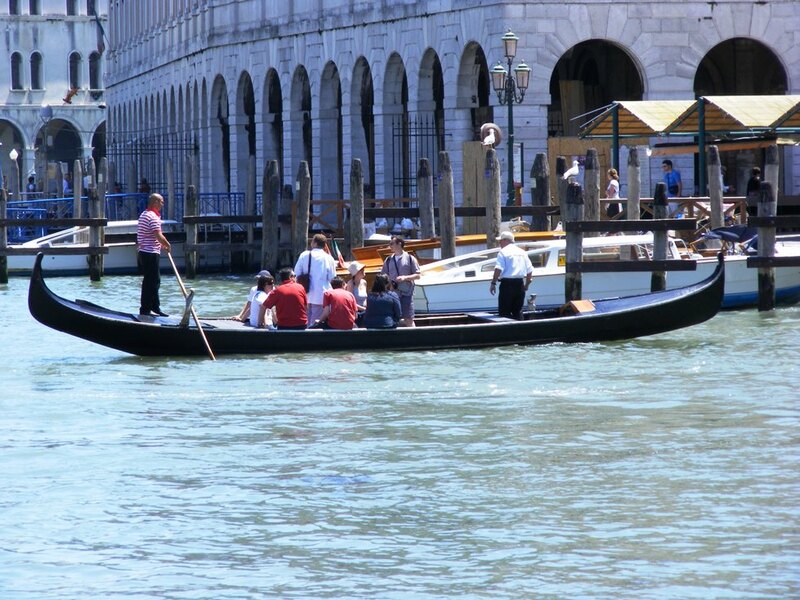 As much as we love to look out on our fleet and admire the curves of our sleek Venetian boats, seeing them absent because they are busy with passengers is even better. And while Sunset Gondola isn't my operation, Tim is a friend and I'm happy to see him doing well. Seeing boats out like that also gives me hope for the economy. This is a beautiful picture, not because of what you see, but because of what you don't see. "I am afraid I study the gondolier's marvelous skill more than I do the sculptured palaces we glide among." I think Twain was on to something. 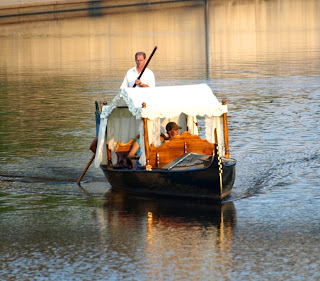 I received this photo yesterday from John Kerschbaum of Gondola Romantica in Minnesota. 3. Some day, if I was lucky, I'd get a chance to try "pumpkin paddling". 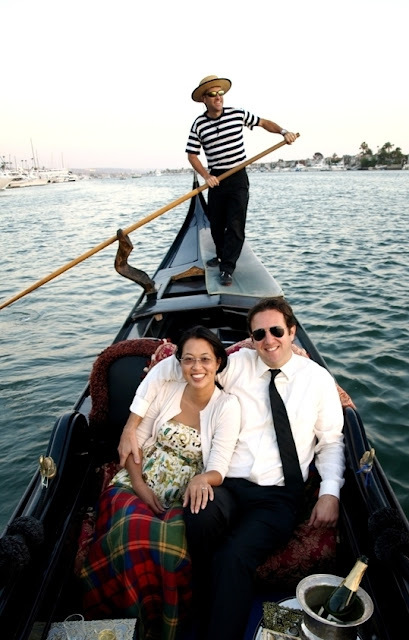 gondolier Alex Shern (on the bow), Gondola operator John Kerschbaum, and gondolier Amy Ebertz (in the passenger seat). Now, to explain a little about what we're looking at. Last year, the Stillwater, Minnesota chapter of the Independent Business Association held their first Harvest Fest. The event was a big success. 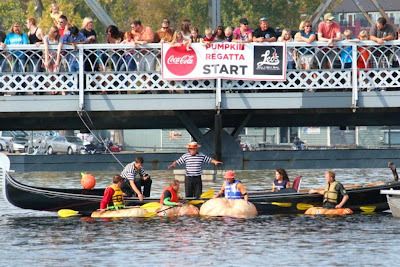 This year's edition included more reasons to attend, including a true-to-life "pumpkin regatta". Pumpkins are often carved to make jack-o-lanterns, but hollowing one out to serve as a vessel - well that takes a much bigger gourd than something you'd buy in the produce department. The pumpkins seen here are of a special variety, I'm told they're grown mostly for uses other than making pie. Display is one obvious application for such a pumpkin. They are also popular with "pumpkin drops" - where the pumpkin is dropped from a height guaranteed to yield destruction, and great reaction from spectators. The really big ones often end up in a weigh-off. The 2010 Stillwater Harvest Fest was the scene of a new record-breaking pumpkin weigh. A contractor from Wisconsin managed to grow, and transport a humongous pumpkin that tipped the scale at 1,810.5 pounds - a full 85 pounds heavier than the current record holder. And as previously mentioned, huge pumpkins can also be carved into boats. Getting back to the above photo, I don't know how he got the job, but John Kerschbaum was the starting judge. Standing on his gondola, he briefed the "pumpkin paddlers" and helped them before the race. In my opinion, you can't buy better visibility for your gondola company than that. The weather was perfect, and thousands showed up for the Harvest Fest. Not surprisingly, someone had a camcorder and captured the race for all of us to enjoy. Here's a link to the clip on YouTube. I take no responsibility for the off-camera conversations and commentary. "ok, here are the rules: there are no rules, so keep it interesting". And at the sound of the horn, they were off and paddling. Well, most of them were. The guy stuck paddling in a circle is actually a candidate for mayor right now (yes, insert your favorite wise-crack here), John told me "I think he got a bad pumpkin". To read more about this year's Harvest Fest, check out http://stillwaterharvestfest.com/. More fun details can also be found on the facebook page for the event. 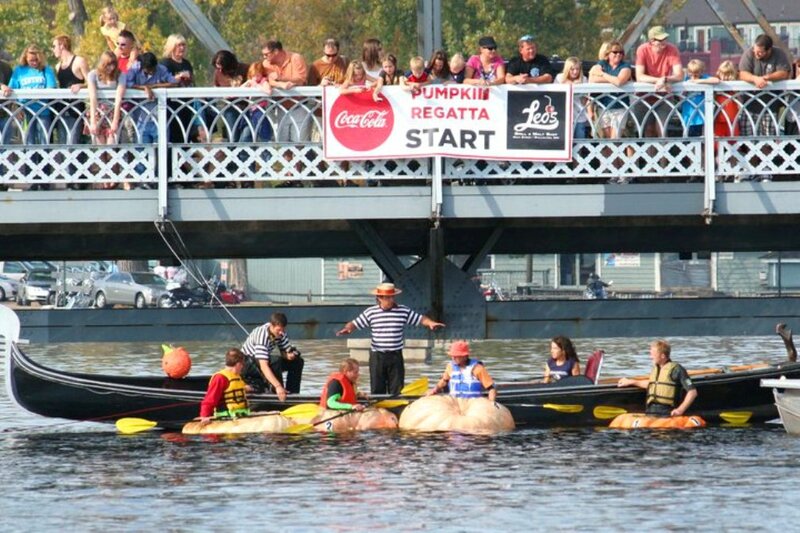 If you still haven't gotten your full pumpkin regatta fix, an image search of "pumpkin boat race" on Google will give you numerous funny pictures from pumpkin regattas in other cities. 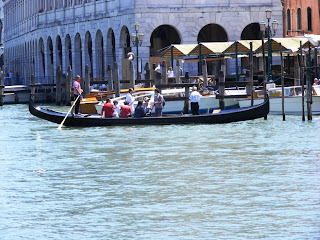 And to see John Kerschbaum actually rowing his gondola, check out the Gondola Romantica video on YouTube. 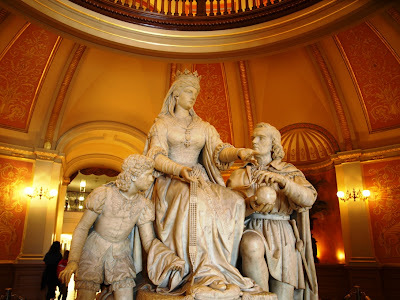 On a recent visit to the state capitol in Sacramento, California, I saw an impressive statue depicting a key moment in history - the moment where Queen Isabella decides to tak a chance on Christopher Columbus and his idea to find a shorter trade route to the Orient. The statue seemed perfect for such a day as this. 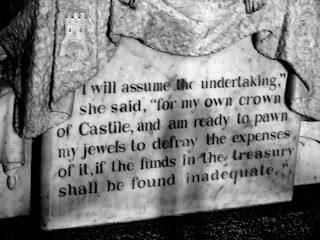 Carved in the base of the statue are words of Queen Isabella, who was willing to pawn her jewels to help finance the expedition. 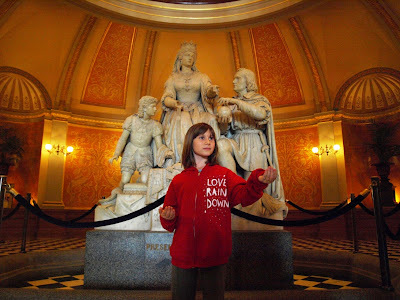 More than 500 years later, my wife and I named our second daughter "Isabella", and upon seeing the statue, she struck a similar pose to that of her namesake and insisted that I snap a picture. Oh yeah, she looks just like her. I stopped by Sunset Gondola tonight to see if they still had my hat - which I'd left there during the last get-together. I noticed Tim returning from a cruise, changed lenses, and snapped a load of photos. Fortunately one of them was good enough to use, so here it is. And just for kicks, I cropped it and messed around a bit with the color. 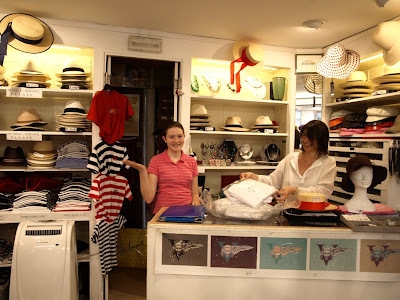 While there are hundreds of vendors in La Serenissima who'd love to sell you a lightweight tourist-grade "gondolier's hat", there are only a few places where you can get the real thing. Bampa is one of them. 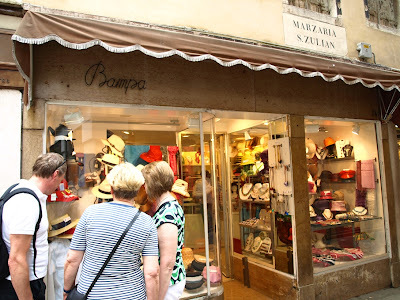 Located in the maze-like labrynth of San Marco, not far from the piazza, Bampa sells uniform clothes and gondolier's hats. I've bought a few italian-made black berets there, and even a panama hat or two (I like to mix it up now and then). Bampa carries lots of the mainstream offerings found in other shops too. A view inside, of the counter and some of the quality items available. To find Bampa from Piazza San Marco, head under the arch beneath the clock tower, take the second right, and the shop is to your right. 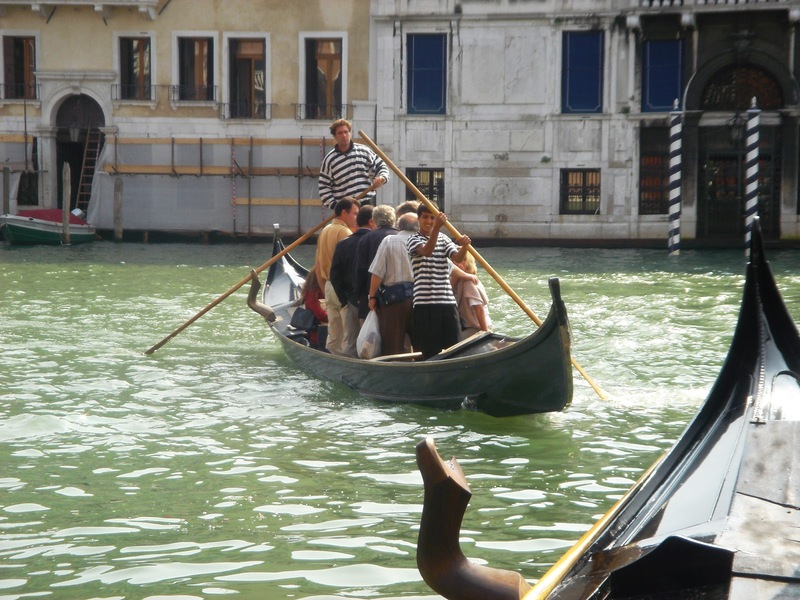 If you think you're close, just ask a gondolier. If he looks irritated, don't tell him I told you to ask. 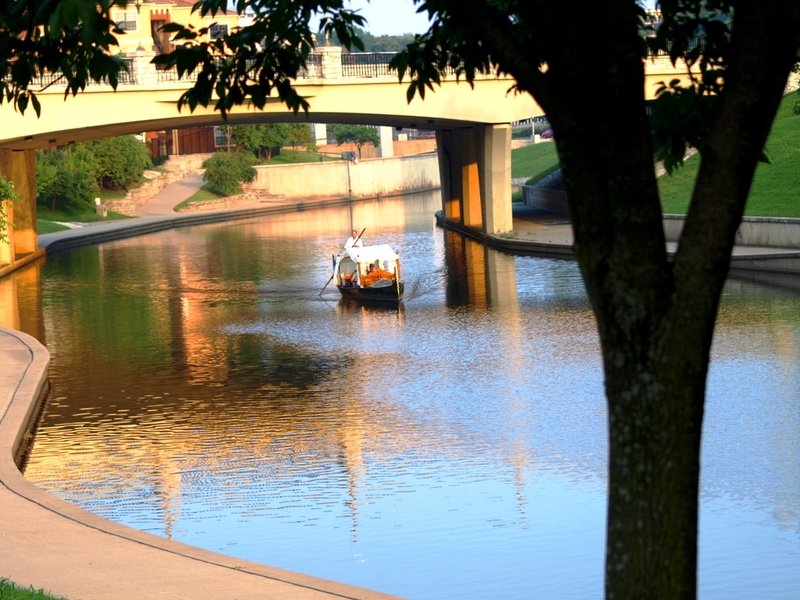 Gondola owner Chris Sperry guides his gondola along the quiet waters of Brush Creek in Kansas City, Missouri. I've been planning with a film crew for the past week to shoot on the gondola. The fall weather, while quite refreshing most of the time, hasn't been that conducive for film until today, so we scrambled to take advantage of it. As the person in charge of finding a good looking couple who would handle themselves well on board and represent the company well, I did the only logical thing: I chose gondola people. Steve and Kat are two of my favorite people. 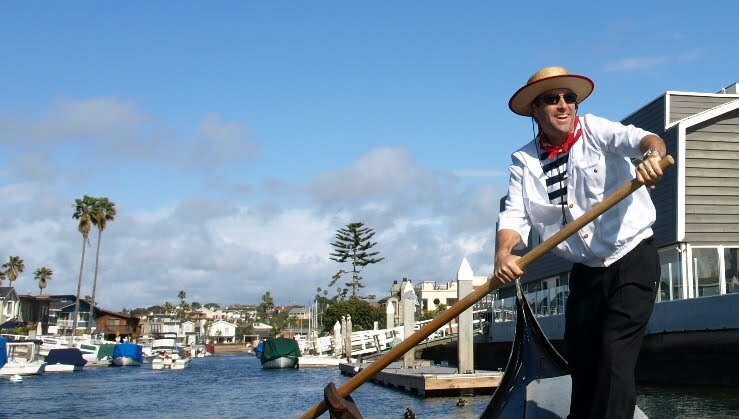 Steve is one of my solid gondoliers, both on motorized and rowing vessels. Kat has served as a gondolier several times, but she has been an invaluable staff member on shore. They met here, and got married eleven months ago. I'm not in a position to divulge information yet about our camera crew today, but I will say that we had a blast working within the boundaries of wind, tide, and changing light to get the best shots possible. 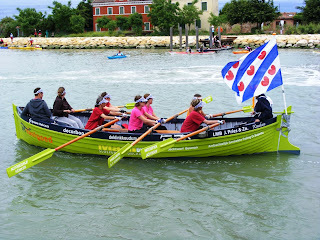 In Venetian rowing, one of the most technically challenging tasks is rowing for film. getting it to go where someone else wants it - someone who may not appreciate all the wind and water factors in the mix - that's a bit more taxing. And you have to do it without making funny faces or using an incorrect grip. The camera is watching. I enjoy a good race, and wind-fights are always welcomed by me and my remo, but I relish the task of rowing for film. In the end, we got all the angles covered and had a great time doing it. Garrett ducked into the workshop and took these photos. The Venetian squero takes it's name from a sort of builder's square that's been used by shipwrights in the region for centuries. 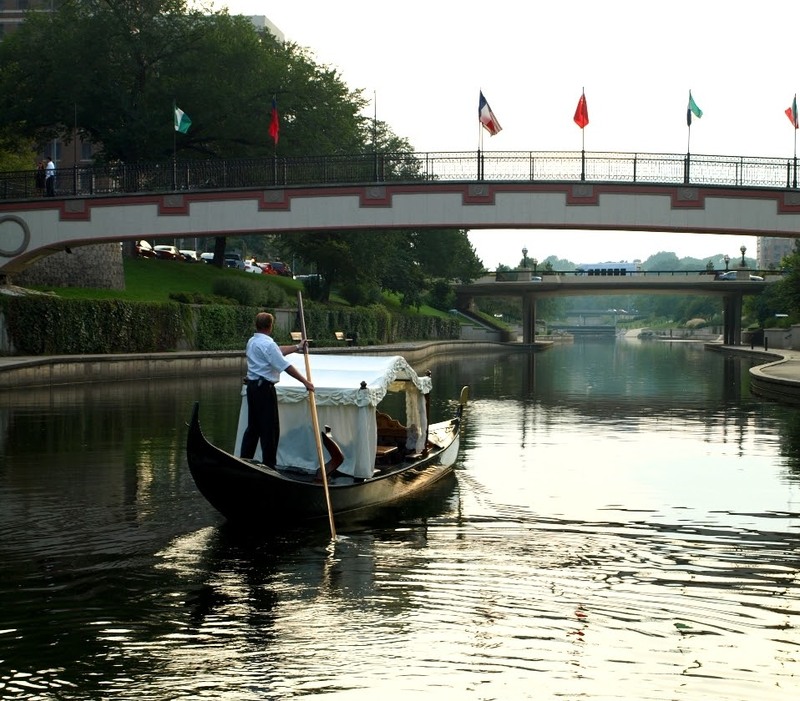 These places are best known for building gondolas, but the truth is that most squeri spend a lot more time servicing existing gondolas than they do building new ones. Squero San Trovaso has the distinction of not only being Venice's most well-known gondola yard, but also the most photographed. In fact I've posted lots of my own photos of the place here. 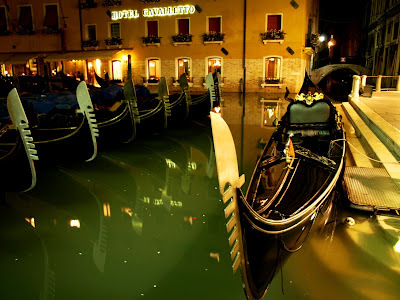 As a gondola fanatic and a photographer, a place like that is what we might call a "target-rich environment". 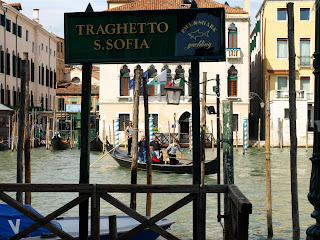 At the risk of accidently creating "traghetto week" here on the Gondola Blog, I'm posting a few more photos of the traghetto Santa Sofia taken by Tamás. 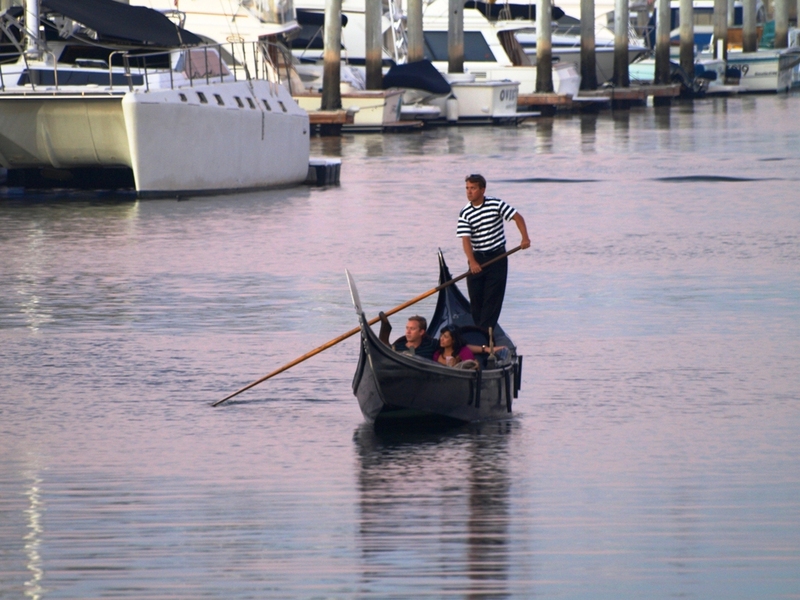 The forward gondolier speaks to a line of passengers as they approach the boat. This looks to be a lighter load than some I've seen, with more passengers sitting than usual. Riding a traghetto is a uniquely Venetian experience. I know some of you have also taken this ride, and I would love to read your comments on the experience. Post a comment, be opinionated if you like, have fun. I shot this photo a while back of gondolier Bob Milspaugh on the bay in Newport. 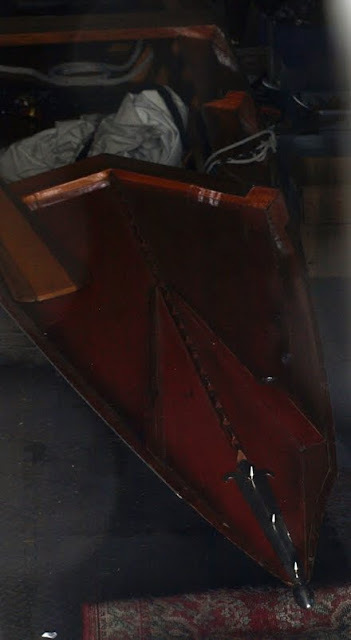 After my post from September 27th, Bob Easton encouraged me to delve deeper into the subject of this ancient vessel - the "traghetto". Built in many ways like her well-known cousin - the gondola, a gondola da traghetto or simply traghetto is a true Venetian workhorse. Taking heavy foot traffic, and bumping into things throughout the day, it's no surprise that this vessel is built more heavily. 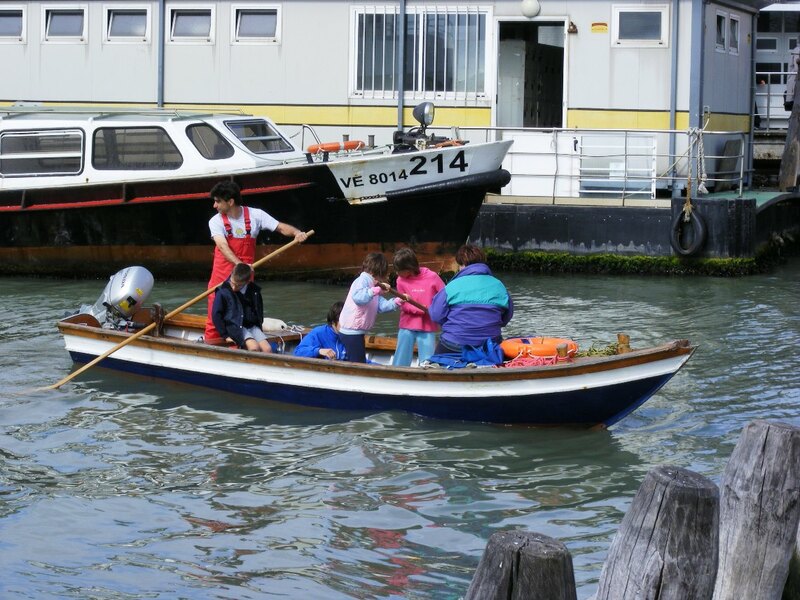 A traghetto is also wider, giving her more stability, and this is important because most of her passengers stand during their voyage across the Canale Grande. 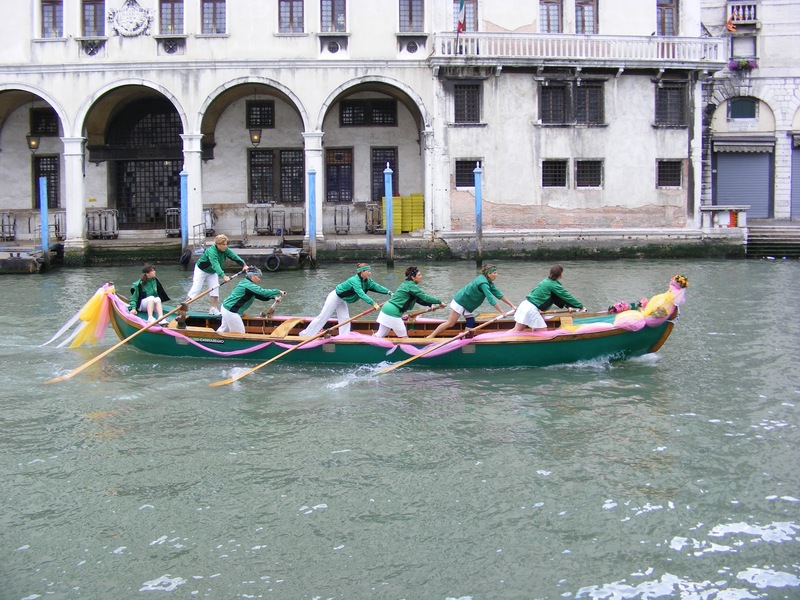 Carrying such a load, these boats are generally rowed by two gondoliers. elder Venetians, mothers with babies, and of course, clueless tourists. Boarding the boat, you pay the forward oarsman, who tosses the coins on or near the bow - making quick change with what's on the deck. I once annoyed one of these guys by producing a 5 Euro bill with a bunch of Venetians behind me in line. Talk about a "rookie move". Needless to say, exact change is appreciated. Venice has three, scratch that, four bridges now to cross the Grand Canal by. Crossing in other places is done by one of these boats, which have served as ferries for centuries. 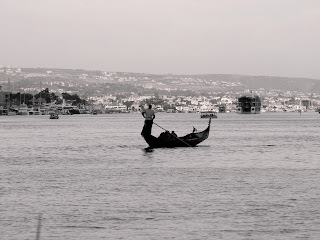 The action shots in this post are from the Santa Sofia traghetto, which touches dock on the western shore near the fish market. 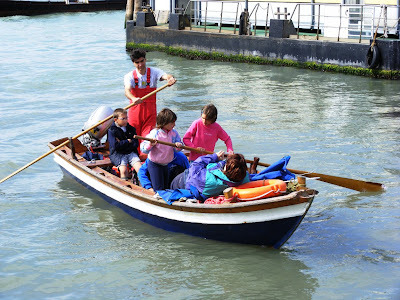 Not everyone in a servizio relishes the task of rowing traghetto. I've heard stories of gondoliers with seniority trying to manipulate the system so the younger rowers spend more time doing the ferrying. Then there are stories of guys who love rowing traghetto - it gives them a chance to catch up with locals as they step on and off the boat. "You want to get better at rowing? Row traghetto." I'm certain that it's true, and if given the chance, I'd love to spend a week doing so. Maybe there are a few guys with seniority who'd like me to cover their shifts. I'm sure it isn't easy. To read another post, featuring a traghetto at San Toma, take a look at my post from January of this year, entitled "Traghetto at Rest - San Toma".